Raditz is a son of Bardock, and Goku's older brother. Raditz is one of the 4 surviving Saiya-jins after Freezer decided to destroy the Planet Vegeta. Raditz works with Vegeta and Nappa destroying and taking over planets through the universe. Then Raditz decides to go to Earth to find his little brother. Raditz comes to Earth and discovers that the life of the planet is still alive. A farmer attempts to shoot Raditz after seeing Raditz's spaceship crash on his property. However, Raditz simply catches the bullet and shoots it back at the farmer, and then Raditz goes to find his little brother. Raditz senses a power of 310 and finds it's Piccolo. Piccolo greets Raditz with a blast, but the blast only manages to destroy some of Raditz's leg hairs. Raditz prepares to kill Piccolo, but he senses his brothers power and then flies off to find him. Goku and his son Gohan are at a reunion with some of Goku's friends on Master Roshi's island. Then Raditz shows up to crash the party. Goku has no idea who Raditz is. Kuririn thinks Raditz is a drunk, but Kuririn gets smacked into the wall by Raditz's tail. Goku sees Raditz's tail and is shocked. Raditz asks Goku if he ever suffered a sever blow to the head, and Goku answers yes. Raditz explains that Goku's real name is Kakarotto, and that Goku is a Saiya-jin warrior from the Planet Vegeta. Then Raditz explains that he is Goku's older brother. Raditz says that the Saiya-jins take over planets and sell them. Raditz asks Goku to join him, but Goku refuses. Raditz then tells how the Planet Vegeta was destroyed and that only 4 full-blooded Saiya-jins remain alive. However, Goku still refuses. Raditz is someone that will not take no for an answer, so Raditz knees Goku in the stomach and kidnaps Gohan. Raditz explains that Goku has 24 hours to kill 100 humans or Gohan will die. Then Raditz flies away with Gohan. Goku can't defeat Raditz alone, but his arch-enemy Piccolo shows up, and Goku and Piccolo team-up to fight Raditz. Goku tracks Raditz with the Dragon Radar, since Gohan had a Dragon Ball on the top of his hat. 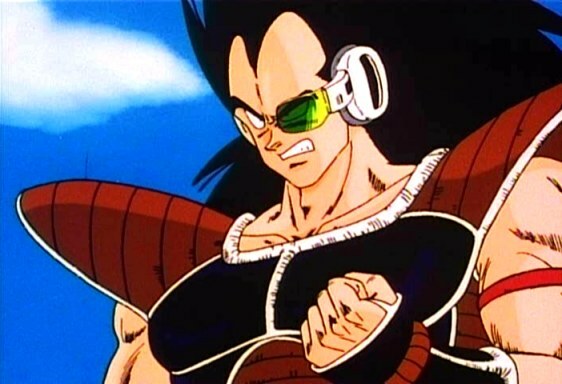 Raditz locks Gohan in his ship, and discovers that the scouter shows that Gohan has a power level of 710. Raditz thinks the scouter is broken until it shows Goku and Piccolo have arrived. Raditz can't believe a child can have such a high power level. Raditz fights Goku and Piccolo and easily overpowers both of them. Piccolo explains that he has a new attack that should be strong enough to defeat Raditz, but Goku would have to last 5 minutes alone against Raditz until Piccolo gathered the energy to kill Raditz. Goku fights Raditz and gets the crap beat out of him. Goku's Kamehameha does nothing to Raditz, but Piccolo has gathered the energy for his Makensappo (AKA Special Beam Cannon). Piccolo fires the attack, but Raditz dodges it. It seems Raditz is unbeatable. Raditz is about to kill Piccolo with his most lethal energy attack, but Goku grabs Raditz's tail. Raditz is now at Goku's mercy. Raditz pleads that he will leave and never bother Goku again if Goku lets him go. Piccolo tries to warn Goku it's a trick, but Goku lets Raditz go. Raditz then immediately hits Goku and stomps him. Gohan then bursts out of the spaceship and headbutts Raditz in the stomach, severly weaking Raditz. Gohan then gets knocked unconscious and is about to be killed by Raditz, but Goku gets Raditz in a full-nelson. Goku holds Raditz long enough for Piccolo to fire the Makensappo one more time. Piccolo's attack kills both Goku and Raditz. Piccolo explains to the dying Raditz that Goku will be wished back to life with the Dragon Balls. However, Raditz gets the last laugh and transmits that information to the other two Saiya-jins Vegeta and Nappa, who have a powerlevel much higher than Raditz's. Vegeta and Nappa will arrive on Earth in 1 year. Goku travels to reach Kaiosama in the "other world" to receive special training to beat Vegeta and Nappa. Vegeta and Nappa decide to try to use the Dragon Balls for immortality instead of wishing Raditz back to life. Piccolo takes Gohan and trains him in the desert. The other Z-Senshi Kuririn, Tenshinhan, Yamcha, and Chaotsu, receive special training from Kami to fight the Saiya-jins.